“Kimono for a Modern Age,” now on view at the Los Angeles County Museum of Art’s Pavilion for Japanese Art, closes Sunday, Oct. 19. Woman’s kimono (kosode) with abstract hemp-leaf pattern, Japan, late Taisho (1912-1926) – early Showa (1926–1989) period. Silk plain weave, stencil-printed warp and weft (heiyo-kasuri meisen). Los Angeles County Museum of Art, Costume Council Fund, M.2012.130.9. A blend of the traditional and the modern characterized life and dress during Japan’s Meiji (1868-1912), Taishō (1912-1926) and Shōwa (1926-1989) periods. During the early 20th century, a majority of Japanese women continued to wear traditional kimono. 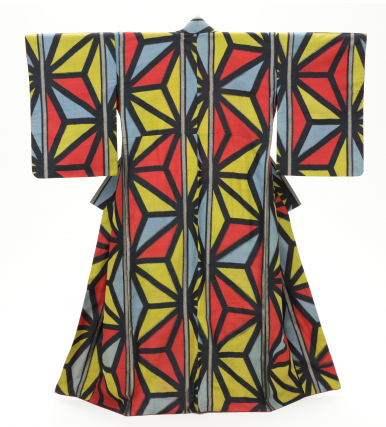 But, as demonstrated in the exhibition, the kimono evolved to reflect the introduction of vibrant synthetic colors, new modes of textile production, and bold abstract and figurative design motifs, often inspired by Western art movements and important current events, such as space exploration. “Kimono for a Modern Age” features more than 30 captivating examples from LACMA’s permanent collection exhibited for the first time. The museum is located at 5905 Wilshire Blvd., Los Angeles. Hours: Monday, Tuesday, Thursday from11 a.m. to 5 p.m.; Friday from 11 a.m. to 8 p.m.; Saturday, Sunday from 10 a.m. to 7 p.m.
General admission: $15 for adults, $10 for seniors (62+) and students with valid ID; free for children (17 and under) and members. For tickets, call (323) 857-6010 or go to www.lacma.org.